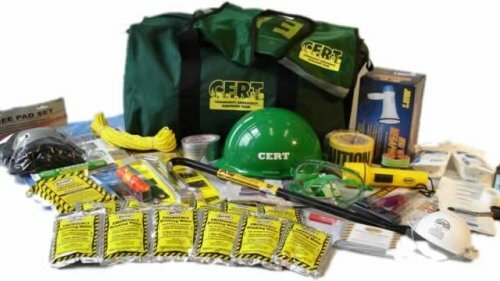 Kit contents: One C.E.R.T. hard hat 1 - Gear Bag (Green with Logo) 1 - Heavy Duty Work Gloves 1 - Chemical Goggles (Vented) One 12-hour light stick (green) 1 safety vest (lime green with reflective orange trim) One N95 dust mask 1 large mayday solar blanket 1 flashlight 1 - Pair of “D” Alkaline Batteries (5-year Shelf Life) 1 - 24-inch Pry Bar 1 lumber crayon 14-in-1 pocket tool 1 - Knee Pads (XL) 1 - 4-in-1 Gas & Water Shut Off 1 - Duct Tape (10 Yards) 1 metal whistle 1 - Caution Tape (300 feet) 1 - Rope (1/4-inch x 100 feet) 12 - Mayday Pouch Water (4.225 oz.) 1 - 5-in-1 Whistle 1 - Mighty Mega Mite Megaphone with Siren 1 - Pair of “C” Batteries 1 - 1200 Calorie Food Bar 1 - Blue Tarp (8 x 10) 1 - Deluxe Poncho with C.E.R.T. Logo First Aid Kit:1 blood stopper 2 - 10 yard Rolls Adhesive Tape (1-inch) 12 sterile gauze pads (4 x 4) 1 - EMT Paramedic Scissors 1 - Hydrogen Peroxide (4-ounce) 2 - SPF 30 Towelettes (Foil Pack) 1 - Pair Latex Gloves About Mayday Industries Mayday Industries is a manufacturer that specializes in disaster preparedness supplies. Established in 1995, they have seen this industry change from West Coast earthquake preparedness to a spotlight on national preparedness brought on by September 11 and the Iraq War. Flagship products are the Mayday food and water rations that they manufacture. These items have a 5-year shelf life and are U.S. Coast Guard approved. In addition, they offer a complete line of disaster related supplies such as Sanitation, First Aid, Shelter, Communication, Lighting, Search & Rescue, Triage, Water, and more.